Welcome to WORLD MEWS REPURRT! Brought to you by the world class repurrting and researching team of Elvira Mistress of Felinity and Sneakers the Texian Tuxedo, at the Feline News Network (FNN)! We consider it our mission to bring you the news that possibly no-one but our fellow felines and their humans, could give a fig about! We aim to point you toward these stories and sometimes even toss in our 2 cents worth on them as well. We encourage you to leave your thoughts in the comments, link back to our reports on your own blog, Facebook, or Twitter, so others can be made aware of the latest news and if you come across a story you think we might be interested in, alert us via the e-mail in the sidebar. Tipsters, whose alerts we use, will get credit, with a link to their blog, or website. Elvira, here, and Wowwww...I am sad and embarrassed....the last edition of this series was in July 2014! The good news is that the sad event it reported on never came to pass and the Cat Blogosphere website is still chugging along. We have done a lot of blogging here to be proud of the pat 2+ yrs, but we let some concepts disappear from our activities as life for us and Daddy Kiril became for challenging. As we head into 2017 we want to try to revive some old, popular ideas, this being one of them. A few years ago Nikita blogged about the Cat Cafe movement for the first time and we did so a few more times since including about the first such cafe in Texas. Houston being where the cat blogging community got its 1st national exposure, with a piece in Time Magazine about the Carnival of the Cats in 2004, we wondered why no cafe had opened up here. With us possibly being the only cat blog in town is it any wonder none opened? Anyway 3 stories in Houstonia Magazine, in recent months, give hope that 2017 could see one open up at last. I recently had my Hoohawectomy and lived to tell about it and Elvira and Sneakers did a review of a really cool book! Like Sneakers I was attracted to the sillier stuff in the book...which meant I had to try real hard to hold my laughter to low-key giggles because laugh-out-loud guffawing and belly laughs could have hurt my surgery area and risk rupturing stitches. Daddy is happy with the way the surgery area looks and I am proud not to have messed with the area, as well. My job with this post is to help promote the book launch and adoption event that will be held to help celebrate National Tabby Day. With the help of Buffy and the humans who helped with the book, one of New York City's most reputable shelters, Bideawee, and the Mayor’s Alliance for NYC’s Animals are helping to launch the book, and celebrate the first-ever National Tabby Day (celebrating cats of all varieties, National Tabby Day was April 9th! ), at an event scheduled for Saturday, April 30 in Manhattan. There will be adoptions, from 10am to 6pm, with a special celebration, from noon to 2, featuring the book launch with author Sandy Robins, with drinks and treats human and animal attendees. The cool thing is that anyone adopting from the shelter that day will get a very generous starter kit with items for their animal companion from the event's sponsors and a photo-op with the book's photographer, Paul Smulson. 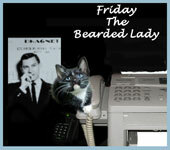 Elvira Mistress of Felinity here with the long-awaited book review promised in a blog post on March 25th. In that post I announced that we had been contacted by a publisher and given an opportunity to review a new book and help publicize a very special feline adoption event to occur at the end of April and that we had received the book and would, all 3 of us, read it. Sneakers and I have read the book...and Friday will do so as well (She was too horny, in recent days, for me to trust her with the task, and is getting her Hoohawectomy today, hee, hee!). Her other task was to explore the website of the shelter helping promote Tabby Day and do some research on the event; she will put the finishing touches on all this as she recovers from today and will post before the end of the month. The book is by humans named Sandy Robins and Paul Smulson, and is called Making the Most of All Nine Lives: The Extraordinary Life of Buffy the Cat (Triumph Books - release date = April 15, 2016). 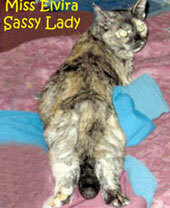 It is a 128 page photo/humor book for cats and their feline loving humans. The promo literature explains..."born into the body of an orange tabby, Buffy has experienced life in a way most humans never do". The book doesn't take the brains of a rocket scientist to read and understand as it is nothing more than photos of Buffy as our hero experiences activities that humans enjoy and shares his thoughts about those activities. The activities chosen for Buffy to experience are a varied lot and the scenes are nicely set up and photographed. Buffy's thoughts about his experiences are comments and wisecracks suitable in length, for the most part, to be used on Twitter. This is not Shakespussy or Tolstortie, folks, so laugh a little, or a lot, your mileage will vary. My favorite part of the book? The Intro. It is where the writer and the photographer (Buffy's dad), explain themselves over 2 1/2 pages. As for what Buffy was up to? I loved the "Billy Goat Tavern", "chess match", "souvenir stand" and "inner meow" shots for their realism; serious scenes that bring out the laugh in the reader and viewer because feline and human can totally relate to such a scene having done, or seen, something similar themselves. Good afternoon felinity assembled, Elvira Mistress of Felinity here! Boy do I have some news! News that makes me feel good and inspired about the future for the first time in a while. We get e-mails, admittedly infrequent, but these type of emails have led to bouts of creativity around here that all of us, beginning with our founder Nikita, years ago, have been very proud of. 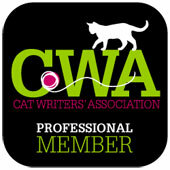 Sandy Robins is an award-winning multimedia pet lifestyle expert and author of the brand new book Making the Most of All Nine Lives: The Extraordinary Life of Buffy the Cat (Triumph Books, April 2016). Robins has helped launch the first-ever National Tabby Day scheduled for Saturday, April 30 in Manhattan. More information on both the book and event can be found below. If you would like a complimentary review copy of Making the Most of All Nine Lives in consideration for a review, author interview or simply a news brief or mention on your site, please reply to this email and simply send me your address and I will be happy to send a book along to you. 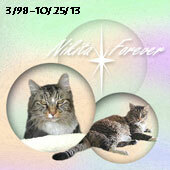 I can also send along more information on National Tabby Day, if needed. The included information intrigued daddy and he alerted me to the email. Over the next few days I shared it with Sneakers the Texian Tuxedo and Friday the Bearded Lady and we debated accepting the offer and what doing so could mean for the future considering other things we had been discussing with daddy since the beginning of the year. I also did a little research on the publisher and was puzzled at first; what's a long time publisher of sports books doing publishing a book about a cat? They appear to have a General Interest Portfolio that currently has 17 categories with more than 50 currently available titles, including one pet book about dogs. Based on that one can assume they may have published other, now out of print, books about pets, including cats, in their 25 year existence. After midnight....the morning of Sept.16, 2014....not long after Daddy Kiril came home from work. 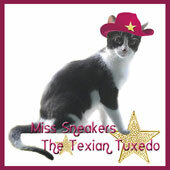 My name is Sneakers and I am the 9th Texian Tuxedo. This post brings to a close a chapter in the newly begun lives of 3, recently born, kittens brought to Daddy Kiril last week. Over the weekend Daddy Kiril, Elvira Mistress of Felinity and I came to the decision that turning the kittens over to BARC would be the best chance they would have to begin new lives in safe, loving, homes. No, BARC, is not a no-kill shelter...it is the Houston city animal shelter and pet adoption agency. It is the only city shelter in Houston required by law to accept every animal that comes through its doors regardless of breed, temperament, health conditions, and circumstance (from owner surrender, stray pickup, rescued or confiscated animals). Good early morning, felinity assembled, Sneakers the Texian Tuxedo here...with what happened when Daddy Kiril returned with the kittens from our vet yesterday evening. When he came in the door he set the carrier down in their safe haven and called Elvira & I into the kitchen for the update reported in the previous post. The task fell to me, as the Texian Tuxedo, and I made it a solemn experience to better impress this occasion on their young minds for all time. Once this ceremony was completed, the little ones suitably attentive and impressed, eyes wide as they listened and swore to not forget their names, I settled down to tell them what I called a "nap time story"...the stories behind each of their names. Then Daddy Kiril returned them to their safe haven for a rest before feeding time. It had been an eventful afternoon and they were very tired.